Khyber Pakhtunkhwa Public Service Commission Date Sheet 2019 officially announced. KPPSC Competitive Exam schedule on PMS Officer (10/2017) positions subject wise Date Sheet 2019 download in PDF as per also available. 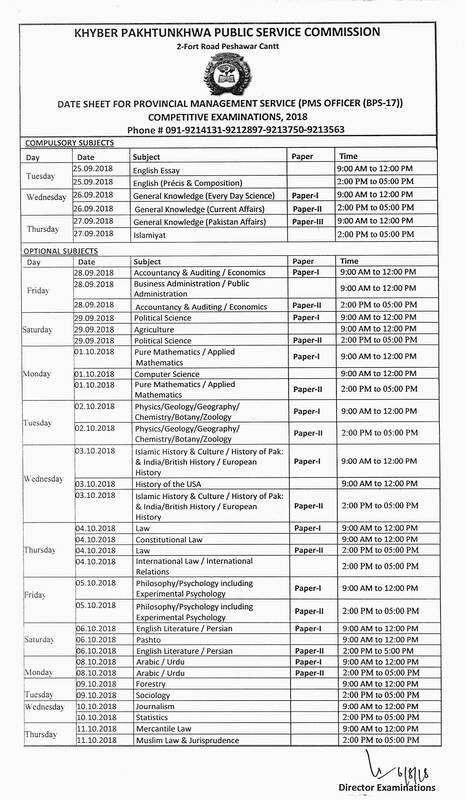 KPPSC PMS Date Sheet 2019 PMS Officer (10/2017) Written Test Competitive Exam Schedule Dated 25-09-2019 to 11-10-2019 by KPPSC Peshawar latest announced. Khyber Pakhtunkhwa Public Service Commission has the mandate to conduct the test and interviews of the candidates against the existing vacancies in the government departments and ministries of Khyber Pakhtunkhwa province. KPPSC has its own schedule to conduct the test of the candidates and it has also maintained its own syllabus for the students to appear in the test and interview. When vacancies are declared vacant in any department or ministry, then these are published in the newspapers to demand application forms from the desired candidates. Date Sheet for KPK Provincial Management Service (PMS-2019) as per candidates get KPPSC date sheets and roll number slips of the candidates are sent on the mailing addresses so that the candidates can appear in the test and clear it to be appointed on the vacant posts. The candidates prepare the syllabus of the test, which is added with the website of KPPSC so that the candidates can download them. They can make preparation of the test and try to qualify it. KPPSC announces the result of the test after some time, which is provided on this page so that the candidates can get the latest update of the test. Khyber Pukhtunkhwa Public Service Commission has released the date sheet for Provincial Management Service (PMS Officer (BPS-17)) Competitive Examinations, 2019. KPK PMS 2019 Date Sheet is now available for download. The exams will be held from September 25, 2019, to October 11, 2019. The exams will be held from September 25, 2019, to October 11, 2019.